Blind Callie, Dachshund No. 4, offered up a hard-to-ignore photo op today. 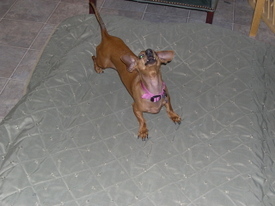 Callie was apparently a bit miffed that she only had a passing mention in Monday's blog about the "other" Dachshunds. (All "minis," she points out a bit huffily. "Not much to them.") As this photo makes clear, there's definitely a LOT to this plump young lady. And yes, she is on a diet, believe me! I walked out of my office this afternoon to get something in the kitchen and saw Callie like this, upside down on a West Paw bed, over in the dining room. This is Callie's favorite sleeping position, and it is utter relaxation for her. Don't you wish you could sleep like this? I was moving 10 tons of big round hay bales this afternoon with the tractor and kept looking at the stunning view off in the distance. 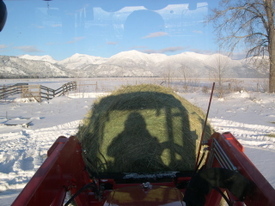 So just before moving the final bale, I stopped at the house and picked up the camera to take this shot. The bale in front weighs about 1,200 pounds, and we lift it with a 'round bale spear' that hooks onto the front loader -- those arms on either side of the tractor hood. Although we feed the horses small square bales these days (they're 75 lbs), the round bales are left over from a previous season and were stored in a neighbor's hay barn. (See how fresh and green this one still is?) So our neighbor hauled the remaining bales over today. We'll feed the round bales to our two Belgian draft horses and the handful of other sighted horses over the next few months. The peaks in the distance are in the Scapegoat Wilderness, part of the Bob Marshall Wilderness Complex. The county gravel road at our south gate, Dry Gulch Road, eventually dead-ends at the trailhead into the Scapegoat. The North Fork of the Blackfoot River flows out of these mountains and runs along the base of the ridge on the left. Our valley is flat (it's called Kleinschmidt Flat, after the earliest settlers in the 1880's) because, long ago, a glacier once came out of the North Fork canyon and flattened everything in its path. If it looks cold out there, it was ... about 10 above zero in the sun. As I write this, at 7:30 p.m., it's 13 below zero and headed lower! Alayne and I were frozen, of course, but the house was toasty warm because we kept the woodstove going all day and the Doxies were in close proximity to it. That's Bailey on the left, new arrival Daisy in front of the stove, and Oscar in his favorite chair. (Also Widget's favorite chair -- she had it all yesterday evening.) 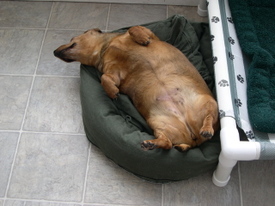 Doxie No. 4, blind Callie, was over by the dining room, waiting for dinner. 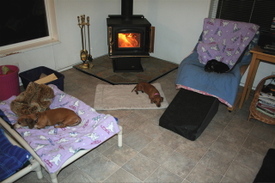 The Dachshunds are just glad someone invented humans to do useful things like make fires and split wood. What Happened To Good Morning America? We wish we knew why the story about the sanctuary didn't air on Good Morning America on Thanksgiving or Friday. To everyone who watched GMA both days waiting to see it, sorry! We knew there were no guarantees that the story would run, but still, we were disappointed. I think it's just in the nature of the TV business. Back in July when the ABC News crew came out, it never occurred to us we'd be sitting here in late November, still waiting to see the story appear! If you'd like to ask Good Morning America to run the piece, you can do so at the ABC News Web site here. Please remember to be friendly and polite ... we don't want them to get cranky with us, or the story will never appear! But maybe some gentle reminders from folks across the country will help the GMA staff see there are plenty of interested people waiting to see it. I've been trying for a year to get this photo. 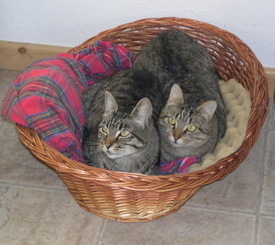 That's Wobbles on the left sharing the basket bed with Claire. It's the first time since Claire arrived last December that I've seen them together like this ... so when I walked into the cat house this weekend and saw them side-by-side, I quickly left to get the camera. When Claire first arrived from a private rescuer in Ellensburg, Washington, we were struck by the similarities with Wobbles. You see, it's not just that they're look-alike tabbies. It's that they also have the same disability, cerebellar hypoplasia, which affects their motor skills and balance. They also are the same age. And they both ended up in shelters just 70 miles apart -- Wobbles came from Moses Lake, Washington, just down Interstate 90. So it always made us wonder whether they started out life as kittens in the same litter. We'll never know ... but at least you can see why sometimes it's a little hard to tell them apart! 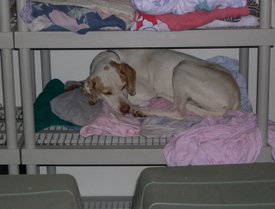 Tyler, a deaf English Pointer, has been with us at the ranch for several years. He lives at Widget's House, our main building for disabled dogs, and has his choice of three different comfy dog beds to sleep on at night. Earlier this week, I was startled to go over one morning and find him -- for the first time ever -- curled up sound asleep on a shelf we use to store dog bedding. Because he's deaf, he sleeps very soundly, so I can walk in and start letting the other dogs out and he doesn't even wake up. The next morning I found him asleep on the same shelf. And the next morning. Finally I realized I should take my camera with me and capture Tyler in his new 'bunk bed.' So yesterday morning, I walked into Widget's House and sure enough, there he was on the shelf. As I started taking photos, he woke up (I think the flash going off may have woken him) ... but he didn't stir. He looked at me, looked around the room, and then tucked his head down as if to say, "Thanks, but I'm not ready to get up yet." That's when I took this photo you see above. Of course, to get his bunk bed just the way he likes it, he rearranges all the stacked sheets and blankets and towels, knocking some to the floor, before he settles in. He expects me to pick them all up, fold them and re-stack them, so he can do it all over again at night. Now, here's the part I don't get. Does that shelf look as comfortable as a dog cot with a foam bed on top covered with a flannel sheet? That's what he's giving up to sleep in his new bunk. Hmm. But there's something about it he really finds appealing, no doubt about it. I found him sacked out like this again this morning, on Thanksgiving. That's five days in a row! Rolling Dog Ranch On Good Morning America? Some faithful blog readers may remember that back in July we had a crew here from ABC News to tape a story for Good Morning America. Well, after more than four months of anxiously waiting to hear when the story would air -- and beginning to doubt if it ever would! -- we finally heard yesterday from ABC News that Good Morning America plans to air the story on Thanksgiving or Friday. They couldn't give us anything more definitive than that, and cautioned that there are "no guarantees" ... so it could still get bumped. But, it's the first we've heard the story has made it to the broadcast schedule, which means they haven't forgotten about it ... so that's good news! And speaking of television, we also have a feature story on the sanctuary that will be broadcast on KSPS Public Television in Spokane, Washington on Thursday evening, Thanksgiving Day, at 7 p.m. Pacific time. KSPS can be seen in parts of Washington, Oregon, and Idaho, as well as in northwest Montana. KSPS also reaches into western Canada, including Calgary and Edmonton. The story is for the KSPS program called Northwest Profiles and was taped here at the ranch in late September. 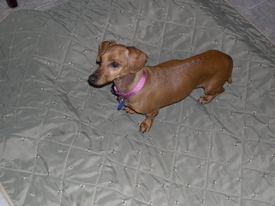 In fact, Daisy has pretty much the same set of conditions as one of our other mini-Doxies, Bailey, who came to us earlier this year from a court case in Great Falls, Montana. Bailey is more compromised, though, and his spine is visibly more curved and his back legs bounce when he's standing still. He also has some incontinence, too. Given the similarities, we thought Daisy would be a wonderful girlfriend for Bailey. She had other ideas. I picked up Daisy at the Missoula airport at 1 p.m. today (it cost only $165 to fly her from Salt Lake City, cheaper than driving -- not to mention two days on the road!) and then continued running errands in town. By the time Daisy and I got back to the ranch about 5 p.m., she had already decided I was her man. Uh oh. Maybe it was listening to George Strait's greatest hits together on the ride home, or the fact that I fed her fresh oatmeal cookies from the Good Food Store in Missoula. Who knows? But I arrived home a marked man. All evening she's followed me everywhere, from one room to the other. I get up, she gets up. I get out of her line of sight, she moves so she can see me. She insists on sitting on my lap whenever I'm sitting down, and at dinner she ended up sitting on a chair at the table. (Okay, so I helped her get up there, but it beat having her on my lap while I ate.) As I write this, she's asleep in my office next to me. I told her I can't type with a Dachshund in my lap. Bailey was quite interested in the new chick -- "hey, someone my size!" -- but alas, Daisy paid him no attention at all. Worse, whenever he'd come over to visit with her, she'd take off. Daisy's totally dissing the poor guy. This was not how I envisioned Doxie love turning out. The funniest thing was when I got the camera out to take her photo tonight, Daisy became a ham ... which is what you see in this photo. She was just a goof, hopping around on that bed, making odd noises, stretching out and then doing a little jump to finish it off. After a pause, she grabbed the blanket with her mouth and started flinging it back and forth. I finally got her settled down, and with help from Alayne off-camera getting her attention, I was able to take the first photo you see above. Some astute readers of this blog have noticed that the short-legs are beginning to take over the ranch. Uh oh indeed. 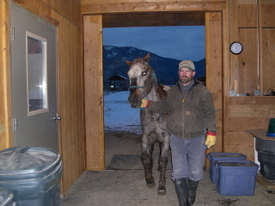 Alayne took this photo of me bringing blind Scout into Beauty's Barn this evening. 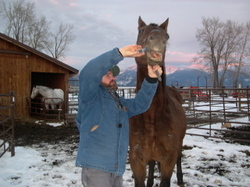 Scout is old, has Cushing's, and doesn't have enough teeth to chew hay properly. This means he is one pampered dude. Not only does he go into the barn every night (and whenever there's a raindrop or snowflake), but he gets to eat equine senior grain, along with steam rolled oats and timothy hay & alfalfa pellets. 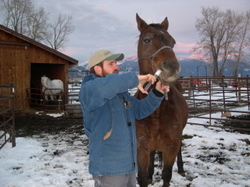 (The other horses would give anything to eat like Scout does.) Scout also gets a medication called pergolide for his Cushing's, in a cherry-flavored liquid we sprinkle on his grain every morning. We lead Scout down the barn aisle and into his stall, then guide him over to his feeder where supper is waiting. If for some reason we take him in before we've dished out his grain in the feeder, he's quick to register complaints with the food service staff. Some guests are just hard to please, you know? 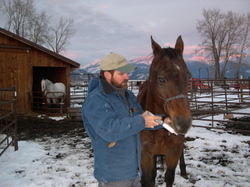 Alayne took these photos this evening while I was giving blind Darby, a recent arrival from Washington state, her medications. Darby is on an antibiotic for a lingering infection from wounds she received before she came here. She was beat up and cut up, and you can see some of the scars and scabs on her chest ... they are all over her. Most are healing just fine, but she's got one under her jaw that continues to get infected. And then, once I've got the fluid going in, I push the syringe farther in towards the back of her mouth, and at the same time with my other hand I push her head up. This makes it harder for her to spit the fluid out and more likely she'll swallow it right away. (That's the theory, anyway.) This is what you see me doing in this final photo. Elapsed time: Under 10 seconds. After getting her dose, Darby got her dinner. That's what blind Cactus Jack in the background is waiting for, too!